NASCAR said Wednesday the failed inspection negates Kevin Harvick's automatic berth he earned into the championship race. 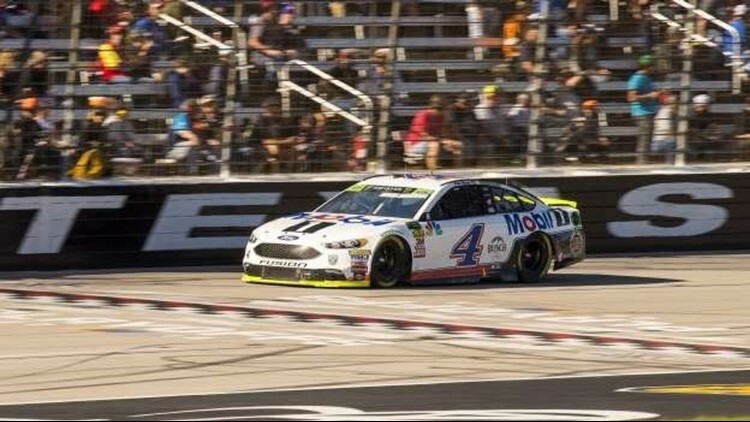 CHARLOTTE, N.C. (AP) - Kevin Harvick has been stripped of his berth in NASCAR's championship race because his winning car failed inspection after Texas Motor Speedway. NASCAR said Wednesday the discovery made after Harvick's win negates the automatic berth he earned into the finale. The No. 4 had an illegal spoiler. The rule in question states that spoilers must be used exactly as supplied from the manufacturer and not altered. The infraction was discovered when NASCAR gave the car a further inspection in North Carolina. Harvick won Sunday's race to join Joey Logano as drivers locked into next weekend's championship race at Homestead-Miami Speedway. Now, three spots will be up for grabs this Sunday in Phoenix.